Design Warehouse is one of our favorite projects. It has been so widely acclaimed that it has even been nominated for a Webby. 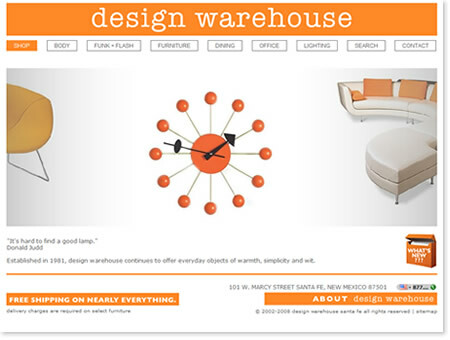 When we first met, Design Warehouse was a twenty-five year old retail specialty store in Santa Fe wanting to expand their business to the Internet. By tapping into online sales channels, the company has been able to solve cash-flow issues associated with seasonal fluctuations derived from tourism-driven sales traffic. An e-commerce solution also provides a way for Design Warehouse to capture sales that could not be closed on the sales floor because of the high-end/price of some of their product lines. The Internet has addressed these internal and external constraints by generating a year-round sales channel that provided easy access for their world-wide clients who learned of the company from visiting Santa Fe, New Mexico.